He's a former firefighter. His name is Rip. He's here to rescue you (from bad diet choices). No, this is not a character summary for an "adult" novel. He's, like, a real guy. Better yet, you can meet him next week at Whole Foods Danbury. 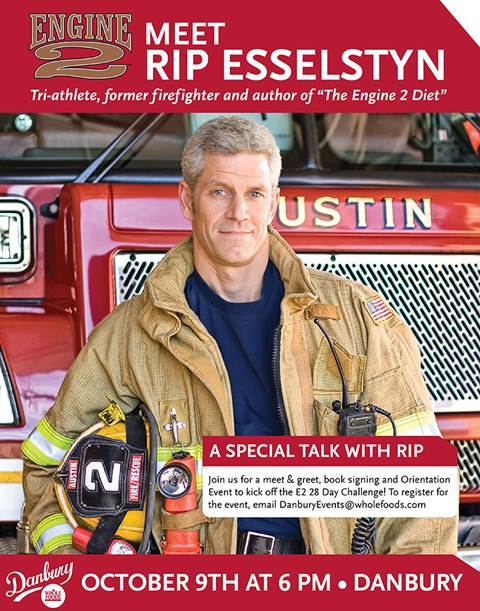 Whole Foods Market Danbury will be hosting a "Meet and Greet" with former firefighter, Engine 2 founder, and author of The Engine 2 Diet, Rip Esselstyn. On Wednesday, October 9th at 6pm, stop by the Danbury store for a book signing and Orientation Event to help Rip kick off the E2 28 Day Challenge! their diets and rescue their health." The results for the firefighters from the Engine 2 Station were so dramatic that Rip wrote the bestselling book, The Engine 2 Diet, to spread the word. After catching the eye of Whole Foods Market Founder and Co-CEO, John Mackey, Whole Foods Market has forged an exclusive partnership with Engine 2 to help promote the health of its team members, customers, and community. Engine 2 was founded with the goal of making the healthiest food line on the planet. The products are "plant-strong," which means they are made from nature's best ingredients: fruits, vegetables, whole grains, beans, nuts, and seeds. Engine 2 Plant-Strong™ products strive for the following guidelines: zero animal products, no added oils, made with whole grains, minimal added sugar (if at all), less than 25% total calories from fat per serving, and 1:1 ratio of milligrams of sodium to calories per serving. For more information about the Engine 2 brand and the 28 Day Challenge visit: http://www.wholefoodsmarket.com/engine2 and http://engine2diet.com/.